Choose from 24 different gift options inside BookWear®! Printed apparel is a walking endorsement, when people are seen wearing your brand. And they wear your shirt for years. We offer compressed T-shirts, scrubs, organic T-shirts, infant T’s and more inside BookWear®. New Products! 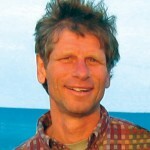 There is a resurgence in the use of tote bags, backpacks and sacks, with greater awareness of re-using and recycling. These are functional and quality bags that fold inside BookWear®. They will be used and seen. Your logo will get noticed wherever the bag is carried. New Products! What a variety of useful products! From flash drives to notepads, rechargeable flashlights to popcorn, and first aid kits to stationery. All of them fit in BookWear® and proudly display your printed logo. Thankfully, college fundraising events and university fund raising campaigns have a significant asset: a loyal base of alumni that, given the right message, tend toward generosity to their alma mater. Fundraising for other markets envy this ready-made donor base who are also comparatively easy to find given that the college or university has their records and addresses. But, this same group is often on a select list of prospective donors that many organizations seek for funding and support. They receive multitudes of donor requests and your college fundraising message must stand out from that crowd. BookWear® is a customized “book” that tells your college fundraising story. Your photos/graphics/message are on the cover. Inside is a gift that’s customized with your logo. Your college fund raising message is read, the package is opened, and every time the gift is used your college fundraising events are remembered. Add to that, the recipient is advertising for you by wearing/using your gift. BookWear® Products are creative, patented and unique college fundraising ideas that gets results. The theme of your “book” can be college fundraising goals and activities, campus nostalgia, academic/athletic/research achievements, a mission statement, or the ongoing contribution your campus makes to education and society. There are sample photographs above of college and university fundraising campaigns. The “Thank You” message in the RIT photo above is common college fundraising text. In addition, RIT supplied us with an informational card (see photo below) that we inserted for free. It included a pie chart showing how the funds were used. “Hope, Building a world-class cancer center in the heart of New Mexico”, shown above, is a capital university fundraising campaign by the University of New Mexico. The BookWear® package was sent out as an invitation to their ground breaking. They supplied us with the detailed insert shown above that gave information about their project, goals, artist’s renderings, and a map to their ground breaking. It was a vision, a capital campaign, and now a reality, a gleaming working landmark to a fulfilled goal that is the embodiment to a successful capital college fundraising campaign. “The BookWear? Puzzles are absolutely beautiful…the colors are amazing!! You all did a fantastic job. So good in fact, that they are almost gone! How long does a re-order take? Thank you.” This was the University of New Mexico’s quote to BookWear® for the first order. We immediately did a second order. “A huge success for our annual fundraiser” was the quote from the University of Maryland for a capital college fundraising event for their library. “A Night of Literary Feasts” was a gala dinner they sponsored to the patrons and donors to the university fundraising campaign. Everyone at the dinner was given a BookWear® package with a “Friends Make a Difference” theme (sample shown in the photo at the top right of this page) and a “Thank You” message. There are 24 gifts and college fundraising ideas available to choose from inside BookWear® including compressed T-shirts, flash drives, mini-packs, and puzzles. These creative fundraising ideas for college are personalized with your logo and are listed at our Products section on the website. The flash drive can be blank or preloaded with your mission statement, college fundraising goals and university fund raising activities. Your patrons/donors want to be informed and involved and BookWear® is a fun and effective way to do it. They are much more likely to be involved and contribute to your future college fundraising events if you communicate effectively with them. Your college fund raising message has immediate sparkle with BookWear® and then longevity with the gift. People remember surprises and BookWear® is full of them. You can mail BookWear® like a postcard. Or send us your college fundraising address list and we’ll take care of the mail fulfillment (we charge postage and a small handling fee). You can insert additional university fundraising materials inside BookWear®: brochures, donor solicitations, return envelopes, invitations, “Thank You” cards, RSVP’s, etc. As long as you supply them ready-to-go we will insert them for free. Your art department may design the “book” or we’ll do it for you. BookWear® has been in the graphic design and printing business for thirty-three years. We have a creative and talented team to help with your university or college fundraising ideas. It’s fun to share that creative enthusiasm we have with the art departments of more than 750 college and university campuses across the country that we’ve worked with. If you want to brainstorm university fundraising ideas for your own BookWear® college fundraising project we recommend going to the Gallery section of our website to view samples of other college and university fundraising ideas and projects. You can click on Higher Education Gallery to look at examples in those sections. Take notice of the layouts, text, colors, themes and photographs that are used. We will be glad to send you more cover samples if you would like them. 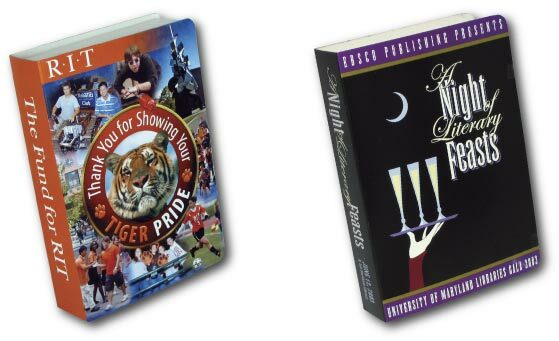 BookWear® works well for your ongoing university or college fundraising campaign. It is easy to inventory in its shrink-wrapped book. It is compact, doesn’t spoil, get dirty or need folding. It’s ready to go when you have a new mailing or college fundraising event to publicize your college or university fundraising mission. Whether it’s a capital campaign, annual fund, phonathon, or other form of college fundraising, advancement is a very key department to the viability and longevity of every college and university. It is a job that, when done well, deserves a compliment like the one on the RIT BookWear® insert; “Congratulations! You are helping to build a wonderful future for RIT. Unlike other college fundraising giveaways, BookWear® is a tangible and dimensional concept that offers limitless ideas to make novel impression. The cover is customized with your graphics and your unique message. Combined with the element of surprise, BookWear® is a compelling form of communication that cannot go overlooked. Traditional college fundraising giveaway ideas are often stale and all too common, thereby lacking novelty, excitement, and effectiveness in their purpose. To truly connect and resonate with your target audience, you need some creative, unique, and interesting. BookWear® offers the foundation to make a meaningful connection, enabling you to get your message across in an amusingly offbeat way. So don’t settle for generic college fundraising ideas. Strike a chord with each and every recipient, and invoke feelings of inspiration and enthusiasm for your cause by using BookWear®.